Lucy, the 3.2 million year old fossil, is the most celebrated hominid fossil discovered in 1974 in Hadar, Ethiopia. The aricle gives an account of how this changed our view of human evolution. C.A.P. Saucier is a freelance writer, illustrator and artist. Her book: The Lucy Man: The Scientist Who Found the Most Famous Fossil Ever! was published by Prometheus Books in 2011. As a teenager, Dr. Donald C. Johanson dreamed of going to Africa to dig for fossils of human ancestors. He had just read in The New York Times about Mary and Louis Leakey finding ancient human bones at Olduvai Gorge in Tanzania in 1959. Many years later, after Don finished college with a brand new Ph.D., his dream of traveling to Africa came true. Not only did Don dig for fossils in Ethiopia, in 1974 he discovered one of the most complete and oldest skeleton of an upright walking human ancestor, a hominin we now know as Lucy. Thus began his long career of scientific discovery and of teaching people how we evolved into the humans we are today. What is it about one pile of old bones that makes it so special and why should we care about how we became human? Let us start with Lucy. Lucy’s skeleton was complete enough for Don to determine that she walked upright on two feet. Don and other scientists calculated that Lucy’s bones were 3.2 million years old. She represented a new species so Don gave her the scientific name Australopithecus afarensis (southern ape from Afar [Ethiopia]). All fossils are given a number indicating where they are found, and in what order. Lucy is A.L. (Afar Locality) 288-1. While Don’s team was celebrating the amazing fossil discovery, they were listening to a tape of the Beatles song “Lucy in the Sky With Diamonds.” Although Don wanted to maintain an academic label for the new find, the team started calling it “Lucy,” and the name stuck. Now that Lucy is the most famous hominin fossil ever found, Don considers it a fortunate happenstance that A.L. 288-1 is known more popularly as Lucy. The next field season after finding Lucy, Don and his team discovered a group of Australopithecus afarensis that had died together. The group that the team called The First Family included males and females of all ages, adults as well as children. The bones of these individuals reaffirmed what Don had learned from Lucy. Up until that time, scientists thought that we became human when our brains grew larger. But australopithecine brains are not much bigger than ape brains, which is why Don did not call Lucy fully human. Don changed how we view science by proving that we were on the way to becoming human when first we stood up and walked on two feet. Humans and near-humans, such as the australopithecines, who are, or were, bipedal (walking on two feet) are referred to as hominins. Evolution means simply that organisms change over time. The engine of evolution is mutation in inherited traits within DNA that generally takes place in response to environmental pressures. Changes are made that enable an individual organism to survive and reproduce, but it takes many generations for a change to show itself as a new species. Charles Darwin announced his theory of evolution through the vehicle of natural selection in 1859. People knew about evolution before Darwin because they had seen animal fossils of living species showing changes over time. Nineteenth century society had a problem accepting Darwin’s novel proposal, though, that humans shared a common ancestor with apes and that we evolved in Africa. Paleoanthropologists today know that both of those things are most certainly true. A paleoanthropologist, such as Don, is a special kind of scientist, who studies how we became human, or human evolution. With Darwin’s theory in hand, 19th century scientists still needed physical evidence in the form of human fossils and the scientific knowledge to interpret the meaning of their findings. Only then could an understanding of natural selection develop. A few years before Darwin published On the Origin of Species, a Neanderthal skull had been found in Germany in 1856. Scientists were not sure if this was from a deformed modern human or something else. Years later, a Dutch physician, Eugene Dubois, who disagreed with Darwin about humans originating in Africa, searched for human ancestors in Asia. In 1891, he was quite lucky to find a one million year old skull and thighbone of a Homo erectus on the island of Java (Java man). Later in 1924, Dr. Raymond Dart discovered the first hominin in Africa. At that time, the 2 million year old skull, called the Taung child, was ridiculed as being a baby ape. Scientists now know it is an Australopithecus africanus, a key fossil in comprehending human origins. Scientists tried to assemble the jigsaw puzzle of human evolution with these few pieces of human fossils. Then World War II temporarily suspended the search for fossils. In the 1960s, paleoanthropology really took off as a separate field of scientific study. Louis and Mary Leakey pulled together data from other sciences, such as geology, to target an area where hominin fossils ought to exist. That brought attention upon the Great Rift Valley in Eastern Africa. That is where Mary found the skull of Zinj (Zinjanthropus, or Australopithecus boisei) at Olduvai Gorge. Zinj, also called Nutcracker Man for his powerful jaws, fired the imagination of others, such as Don, to look farther and wider. Since Mary Leakey’s groundbreaking find, many other exciting discoveries have taken place in addition to Lucy. Fossils of our species, Homo sapiens, have been found in Africa dated at 200,000 years old. The fossil record of our human and human-like ancestors reaches back before that more than 6 million years ago. Paleoanthropologists have found greater than 20 species of hominins that tell much more of the story of human evolution. There are too many species to tell about in a brief article, but several significant fossil finds are shown in Our Human Family Tree. It is important to recognize that the common idea of humans evolving from apes is not accurate. We share a common ancestor with apes. That creature evolved along two different pathways – one path to today’s great apes, and a separate path to human evolution. Between 7 and 6 million years ago, the first hominin leading to humans split from the ancestor of chimpanzees. Still, because we have an ancestor in common, today we share 98% of our genes with chimpanzees. Naturally, it is the 2% that makes all the difference! 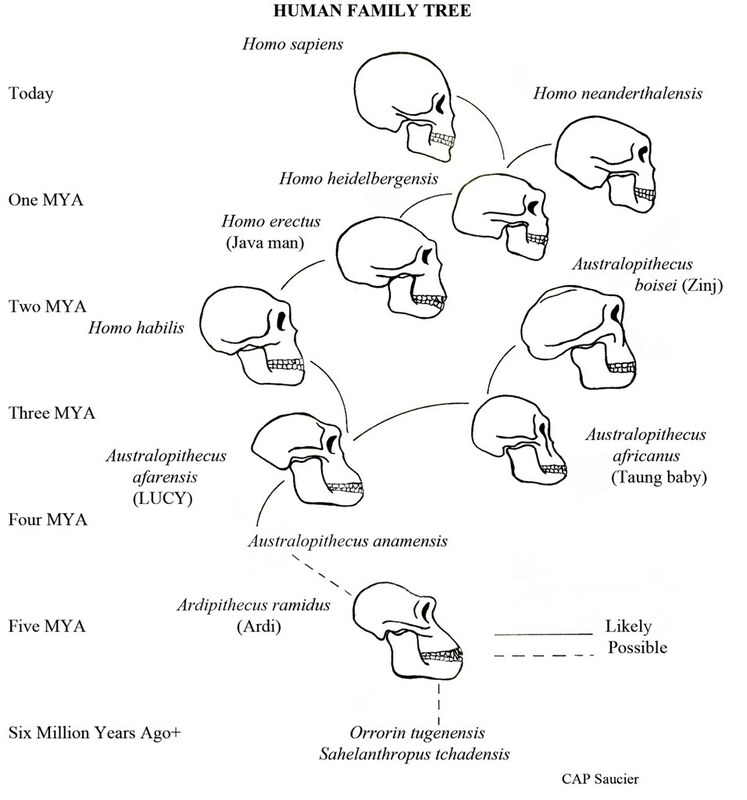 As the chart illustrates, other species of australopithecines lived at the same time or at different times than Lucy and afarensis. Some australopithecines also lived along side of the first species of Homo 2.5 million years ago. Not every species found is a direct human ancestor and some may have been extinct branches of our human family tree. Afarensis is the australopithecine about which scientists know the most. Lucy and The First Family are the reference fossils to which all new hominin fossil discoveries are compared. Recent hominin fossil discoveries that have been in the news include Homo floresiensis (the Hobbit), Ardipithecus ramidus (Ardi), and others. Each of these finds is examined and evaluated to determine where it fits in the jigsaw puzzle of human origins. 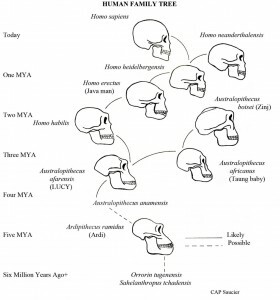 Paleoanthropology is a relatively young science for being about extremely old human ancestors. At first, with just a small set of fossils and untestable theories, paleoanthropology was considered a “soft” science. But today, with hundreds of hominin fossils and more sophisticated analyzing techniques, paleoanthropology is a “hard” science based on scientific experiments and accurate results. For instance, DNA analysis has become essential in determining differences and similarities among species as they have evolved. Only this year, genetic analysis established that Neanderthals interbred to some degree with humans. Meanwhile, the chemical composition of fossil teeth now shows us where hominins lived and what they ate. The study of human evolution has itself evolved into a multi-disciplinary effort that includes not only geneticists and chemists, but also biologists, geologists, primatologists, and climatologists. Through the scientific efforts of all these fields, paleoanthropologists know that Homo likely arose in response to a climate change in Africa that resulted in more meat-eating, a larger brain, and the use of stone tools. Excavations are ongoing in areas of Africa where ancient rocks that are up to 3 million years old may reveal the fossil bones of an as yet unidentified human ancestor of the genus Homo. Paleoanthropologists are also exploring other distinguishing features of humanity that do not fossilize. They want to answer the question, “What does it mean to be human?” It is obviously more than using tools. We know that Lucy’s species lived in family groups. But at what point did people begin to communicate with each other through language? Were Neanderthals capable of talking to each other? We see beautiful prehistoric paintings in caves that are older than 40,000 years. When did our ancestors begin to think abstractly and express themselves through art? Is compassion a particularly human emotion and when did it emerge? Increasingly, the evolution of behaviors that make us human is being researched by paleoanthropologists. “In order to move forward as a species, we need to embrace our past and understand our place in nature.” Donald C. Johanson, Ph.D., The Lucy Man: The Scientist Who Found the Most Famous Fossil Ever!, by CAP Saucier, Prometheus Books, 2011. Why should we care about how we became human? Because we are curious and intelligent beings, it is natural for us to want to learn about our origins. The fossil bones of our ancestors link humans directly to the natural world and prove that we are the product of evolutionary change just the same as other animals. Genetic evidence confirms that we are interconnected to all other life on this planet with humans holding one of many unique places in nature. Evolution is not something that just happened in the past, human beings are still evolving in small ways, such as in changing dietary mechanisms and resistance to certain diseases. Humans have an impact on the natural world, as shown through rapid climate change and the imminent extinction of other animal species. We have an obligation to be responsible for our actions. As we and other living creatures continue to evolve, our future remains mingled with the future of the planet. Extinction is an inevitable result of evolution that we should study and learn from, not only for other life forms, but also for ourselves. What can future scientists do in the field of paleoanthropology? The science needs more young Dr. Johansons to go out in the field and explore for hominin fossils, particularly in the early Homo time frame of 3 to 2 million years ago where the record is scant and begging for new data. But if you do not see yourself in Africa, analytical minds are in demand to study the fossils already collected. Chemists, geneticists, sociologists, and others are needed to add to the scientific knowledge base. Finally, even though we did not evolve from apes, we are genetically related to them. All great apes today are endangered by loss of habitat and poaching. Gorillas, chimpanzees and bonobos, orangutans, and gibbons all face extinction. It is up to us to preserve and protect our primate cousins. The wonder of our world will be diminished without the great apes. We will lose valuable information about ourselves that only they can offer to better understand our evolution as humans. I hope this sketch about human evolution, brief and broad as it is, inspires you to read more. A young scientist with a sharp mind and a keen sense of curiosity will find much to love in the fascinating field of inquiry about ourselves.